I was talking with my Aunt Willow on the phone one afternoon, bantering back and forth about her job, problems selling her house, etc when my other line beeped. I clicked over and said “Hello!” An EXTREMELY AFFABLE male voice said “Oh Hi! I’m looking for Jen Johnston.” “This is she,” I answered. “Have I got her?” the voice asked again. “You sure have,” I replied. “Sorry about that, I should switch to my good ear” said affable voice. While this exchange was going on, another one was taking place inside my head. My brain knew this was someone from the movie world and was frantically rummaging through its’ trivia files (currently in control of 95% of all dusty attic space) trying to place the voice. My inner voice hit on the identity of affable voice, approximately 2 seconds before he identified himself. I am very much afraid that the conversation temporarily continued without me as I rifled through my previous comments to see if my “fear-of making-a-goober-of-self” paranoia triggered by William’s unexpected arrival on my phone was about to be validated. (Not that I minded the call in the slightest. 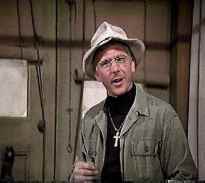 Quite the contrary, for the man synonymous with M*A*S*H’s Father Mulcahy has the enviable capability to put someone immediately at ease. Plus, when I called my Aunt Willow back, I got to respond to the question “Who was that?” with “William Christopher.”) William is so friendly, I found it quite impossible to be nervous. We made arrangements to speak the next day and hung up. I assume William went about his day per normal. I went into full pre-interview panic mode. 2. Think up some questions. Then if time allows I proceed to step three. I thought that re-examining my prepared list of insightful, thought provoking questions might calm the paranoia lobe of my brain. It didn’t. I had formulated a list of questions that in my calm, pre-phone call from one of the sweetest men on the planet state seemed fantastic. In my post-phone call state however they seemed woefully ridiculous, almost as though they had been concocted by someone who wished to get the absolute minimum amount of information from a person. This is the sort of good-natured, diabolical humour that runs rampant with Nova Scotia journalists. It was with some anxiety that I called William the next afternoon. His affable voice came on the phone, and we chatted for a few minutes. Then when I could no longer stretch out commentaries about the weather in Nova Scotia vs the weather in California, I asked my first question. I must say, that despite my anxiety level at that point, I still managed to represent entertainment writers as a whole with the same degree of aplomb as a prom date leaving the bathroom trailing seven feet of toilet paper along on her shoe. This is only my sanitized version. I wasn’t nearly that articulate. I asked William if he had a favourite M*A*S*H episode. “I do. I can’t quite remember the name but it was in the first year of the show. 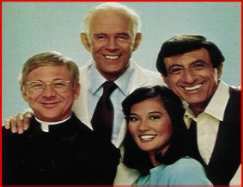 The episode where Father Mulcahy does a trachiometry in a hostile area by phone.” When I asked which he found the most challenging to film he said “I think it’s called ‘Point of View.’ The episode shot from the point of view of a wounded soldier. There was a long, long, long, shot (7 minutes) in the episode, and nobody could make a mistake. If we did, we would have to start all over again. detailing their own experiences in dealing with an autistic child, their son Edward. Mixed Blessings is written in such an open style, that I frankly wondered if it had been difficult to write. Interspersed with all of my questions I found myself sharing details about my life with William. Everything from my daughter, to my wish that I played the piano more often, to my thoughts that more people should see French films came pouring out. This is an odd experience for me, as I generally don’t share those kinds of details with people I’ve just met. I really couldn’t help myself as William is easily one of the most disarming people I have ever encountered. His sincerity, and genuine warmth come out in his every comment. (Not to mention his exceptional dry wit.) He has left me with the portrait of a lovely, (from his genuine sweetness), exceptional (from his huge heart), and brave (from his patience and love for Edward) man to paint. What a marvellous man. 1. Look for a local autism society to contribute to. Most large centres have one. and ask how you can help.